In Goa temple Poojari came close to me & asked in low voice: "Got Rum!!?" I replied: "Yes, OLD MONK.."
The Poojari became very angry. Teacher: where were u born? BITS-Goa Student Krunal Kishorbhai Patel Grabs Rs 1.4-Crore Offer From Google. And hum sab Engineers Facebook par beth ke logo ke comments padhte hai ! India dekne ke liye foreigners goa aate hai aur foreigners ko dekne liye apne indians goa jate hai. Scenario 1 : Two guys are fighting & a third guy comes along, sees them and walks on.. Scenario 2 : Two guys are fighting & a third guy comes along and tries to make peace.. The first two get together and beat him up.. Scenario 3 : Two guys fighting and third guy comes nearby house and says "don't fight in front of my place, go somewhere else." Scenario 5 : Two guys are fighting. Both of them take time out & call their friends on their mobiles.. Now 50 guys are fighting.. Scenario 6 : Two guys fighting. Third guy comes and shoots both of them..
Last Scenario : Two guys fighting third guy comes along with a carton of beer.. All sit together drink beer and abuse each other and go home as friends..
You are definitely in GOA. Survey says Delhi is the best city to live in India. And the person who did this survey was actually in Baga Beach, Goa and declared this. Its that time of the year when all our friends used to plan to visit Goa for New Year celebrations, but end up eating Pop-Corn at Home. GOA RADIO ORGANISED A COMPETITION FOR POEMS, IN WHICH THE FIRST LINE MUST BE ROMANTIC, BUT SECOND LINE SHOULD BE THE OPPOSITE. My darling, my lover, my beautiful wife. Marrying you messed up my life. What inspired this amazing rhyme? A bottle of tequila,with some lime!! Baccha: Oye kidar tha itne din se? Baccha: You should not Swear. Gaali dena buri baat hoti hai! Gubbarewala: Oye tere ko pata hai, Fast and Furious ka Actor 'Paul Walker' marr gaya! Gubbarewala: Peene se yaad aya , Goa mein daaru badi sasti hai! Baccha: Par tujhe us se kya malab, tere toh koi bacche hi nahi hai! Gubbarewala: Daaru ka Baccho se kya lena dena be BC! Ab is se pehle mein FURIOUS ho jau, tu FAST FAST yahan se nikal ja,Warna Pita ka toh pata nahi, par teri shakal dekh ke log ye zaroor puchenge"Haaye, isko itni buri tarah se kisne PITA"
Bhakt- He bhagwan, kya aap meri sharaab chhudwa sakte ho ? Bhakt- To meri 12 botal scotch goa se aate waqt Maharashtra police ne japt ki hai, wo zara chhudwa do.!!! Wife: "tum GOA ja rahe ho to mujhe apne sath kyu nahi le jate? Husband: Are pagli, koi restaurant jata hai to Tiffin sath lejata hai kya ? Few days back MOTHER's Day tha to Pappu accepted his mom's long pending Friend Request on Facebook!! Socha Maa khush ho jayegi!! "Tu Goa kab gaya tha?" "Yeh saari ladkiyan kaun hai?" "Prateek (my roomie) cigarette pita hai? Uski mummy ka number de mujhe?" "Yeh Ankita kaun hai? Badi photo khichata hai tu iske saath?" "Sach sach bata, sirf dost hai.. ya aur bhi koi baat hai?" "Kitne chote chote kapde pehenti hai yeh? 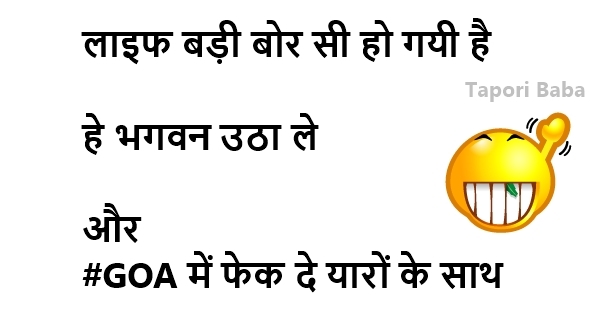 Sab dikh rha h iska! Yeh sab nahi chalega.. keh deti hun!" "Aur tu pub aur bar bhi jane laga hai.. meri kasam kha k bol, tu pita toh nahi hai?" "Mein abhi tere papa ko batati hun!!" Two Bengalis = a film society. Three Bengalis = political party. Four Bengalis = two political parties. One Bihari = Laloo Prasad Yadav. Two Biharis = booth-capturing squad. Three Biharis = caste killing. Four Biharis = entire literate population of Patna. One Punjabi =100 kg hulk named Pinky. Two Punjabis = Pinky with his bigger brother Twinky. Three Punjabis = assault on the McAloo Tikkis at the local McDonalds. Four Punjabis = combined IQ equal to one. One Mallu = coconut stall. Two Mallus = a boat race. Three Mallus = Gulf job racket. Four Mallus = oil slick. One UP Bhaiyya = a milkman. Two UP bhaiyyas = halwai shop. Three UP bhaiyyas = a fist-fight in the UP assembly. Four UP bhaiyyas = mosque-destruction squad. One Gujju = share-broker in a Bombay train. Two Gujjus = rummy game in a Bombay train. Three Gujjus = Bombay’s noisiest restaurant. Four Gujjus = stock market scam. One Andhra ka Anna = chilli farmer. Two Andhra anna = software company in jhopadi. Three Andhra anna = Naxalite outfit. Four Andhra anna = Blue film with local casting. One Kashmiri = carpet salesman. Two Kashmiris = carpet factory. Three Kashmiris = terrorist outfit. Four Kashmiris = shoot-at-sight order. One Tamil-Anna = priest at the Vardarajaperumal temple. Two Tam = maths tuition class. Three Tam = queue outside the U.S consulate at 4 a.m.
Four Tam = LTTE group. One Bombayite = footpath vada-pav stall. Two Bombayites = film studio. One Sindhi = currency racket. Two Sindhis = papad factory. Three Sindhis = duplicate goods shop in Ulhasnagar. Four Sindhis = Hong Kong Retail Traders Association. One Marwari = the neighbourhood foodstuffs adulterator. Two Marwaris = 50% of Calcutta. Three Marwaris = finish off all Gujaratis & Sindhis. Four Marwaris = threaten the Jews as a community. One Rajasthani is a cattle-seller. Two Rajasthanis is a mason. Three Rajasthanis is a puppet show. Four Rajasthanis is a folk dance-drama. One Goan is Remo Fernandes. Two Goans is a Feni distillery. Three Goans is a football club. Four Goans is an all-night-long beach party. One Mangalorean is a supari seller. Two Mangaloreans can’t stand one another. Three Mangaloreans is an Udupi restaurant. Four Mangaloreans is a fanatical Konkani Sabha. One Maharashtrian is a bus conductor. Two Maharashtrians is a kabaddi match. Three Maharashtrians is a Ganpati procession. Four Maharashtrians is a Shiv Sena Shakha. One Kutchi is a kirana shop. Two Kutchis is a stationery shop. Three Kutchis is a saree shop. Four Kutchis is the entire Bombay retail trade. One Sardarji is a truck-driver. Two Sardarjis is a roadside dhaba. Three Sardarjis is a terrorist outfit. Four Sardarjis are always found in jokes. One Kannadiga is a coffee estate. Two Kannadigas is a Udupi restaurant. Three Kannadigas is a pepper powder factor. Four Kannadigas is an anti-Cauvery squad. One Punjabi is chhole-bathure 5 times a week. Two Punjabis is one bottle of whisky in one night. Three Punjabis is a public fist-fight. Four Punjabis is 200 kg of excess weight. One Parsi is a sentence punctuated with BC’s and MC’s. Two Parsis is a doctor and a lawyer. Three Parsis is a 75 year old man and his two unmarried sisters. Four Parsis is half their remaining population!